Groundwater recharge basins collect excess runoff during heavy rains and allow the water to infiltrate into the soil and replenish the groundwater supply. Fisher's lab conducted experiments at recharge sites in the field, as well as in the laboratory using soil cores from field sites. 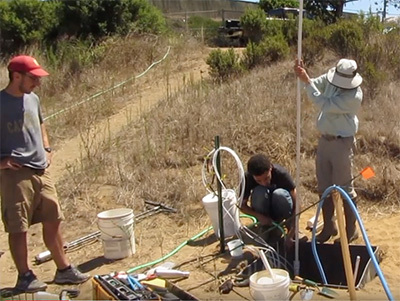 Researchers at UC Santa Cruz are addressing both issues with an ongoing program in the Pajaro Valley, where they have been implementing and studying groundwater recharge projects and evaluating methods to improve water quality as it infiltrates into the ground. "As we ramp up groundwater recharge efforts, it's important to avoid contributing to problems with water quality. If we're putting good quality water into the ground, it will dilute any contaminants that are already in the groundwater," said Andrew Fisher, professor of Earth and planetary sciences at UC Santa Cruz. In a study accepted for publication in Water Research and available online, Fisher's team showed that simply adding a layer of woodchips where water infiltrates into the ground can remove nitrate from the water by stimulating microbial activity in the underlying soil. Sarah Beganskas, who led the study as part of her Ph.D. thesis research, said the wood chips provide a source of carbon needed by denitrifying bacteria in the soil. "We were able to see an increase in the removal of nitrate from the water and, at the same time, increased abundance of the microbes that carry out this process," she said. "Wood chips increased nitrate removal even at fast infiltration rates, which is important because recharge sites with high infiltration rates are often preferred." Just as important is that wood chips are relatively inexpensive. "It has to be a cost-effective technology to be practical," Fisher said. Fisher's groundwater research program is yielding valuable results just as California has begun a serious push for sustainable groundwater management throughout the state. Under the Sustainable Groundwater Management Act (SGMA) passed in 2014, new agencies are being established throughout the state to manage groundwater resources. "This is a window of opportunity for us to get some of these ideas out there and give the agencies some choices and tools they can use," Fisher said. "California has an abundance of runoff. The problem is we don't have enough places to put it on the surface. We have a lot of space underground." Fisher and his students have been working with the Resource Conservation District of Santa Cruz County to identify potential sites for groundwater recharge by mapping stormwater runoff and hydrologic conditions throughout Santa Cruz County and northern Monterey County. Their analysis identifies sites with both sufficient runoff and good conditions for infiltration of water into underlying aquifers. Their report, along with maps and other data from the project, is available online. Beganskas noted that even in a dry year, a single intense storm can create a lot of runoff. Furthermore, many climate studies predict more extremes in precipitation patterns as global temperatures increase. That means more extremely wet years and extremely dry years. It also means more intense rainfall, with more of the rain running off rather than soaking into the ground. "Both climate change and changes in land use, where development creates more impervious surfaces, are driving increased runoff. So that really motivates these efforts to collect runoff for recharging the aquifers," Beganskas said. Fisher is also working to address the economic challenges of groundwater recharge projects. He proposed a program of "recharge net metering" to help landowners recover the costs of installing and operating groundwater recharge basins on their property. It was approved by the Board of Directors of the Pajaro Valley Water Management Agency in 2016 for a five-year trial, and Fisher said he hopes the program can serve as a model for other regions facing similar challenges. "We've been trying to hit the problem at multiple levels by partnering with regional agencies and collaborating with other researchers," he said. Fisher serves as campus lead for the UC Water Security and Sustainability Research Initiative (UC Water), which is helping to build collaborations and partnerships to address water management issues. 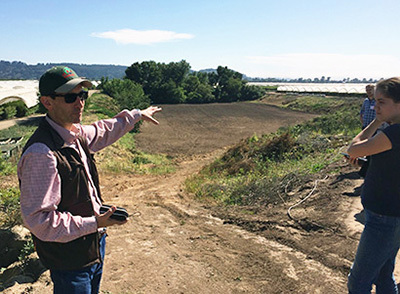 The research on nitrate removal is part of a collaboration with microbiologist Chad Saltikov, professor and chair of microbiology and environmental toxicology at UC Santa Cruz, with funding from the Gordon and Betty Moore Foundation. In ongoing studies, the researchers are comparing the effectiveness of different carbon sources as soil amendments to stimulate nitrate removal, and they are investigating similar approaches for addressing other contaminants. "Nitrate is arguably the most pervasive groundwater contaminant, so that was our number one concern," Beganskas said. "We are starting to look at other contaminants as well, such as arsenic, which is a growing concern in some areas." Fisher said the Pajaro Valley has been a good site both for testing practical solutions and for doing interesting scientific research. The area is heavily dependent on groundwater and faces serious problems from overpumping, including saltwater intrusion from the coast. As a result, landowners and the regional water agency are highly motivated to try strategies like managed aquifer recharge. "And there's good science to be done," Fisher said. 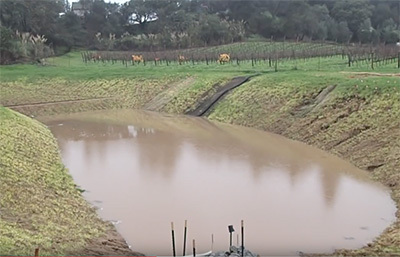 "These recharge ponds give us a spotlight on the processes that occur as water infiltrates into the ground, and our findings are helping us design effective recharge strategies."